"No executive branch reform in the twentieth century - indeed, perhaps in the Constitution's 210 years - has enjoyed such high-level attention over such a broad range of activities for such a long period of time," said Brookings scholar Don Kettl in 1998. Here's what we accomplished. "When the Vice President began this Administration's bold journey on the road to reinventing government eight years ago," said National Partnership for Reinventing Government Director Morley Winograd, "he thought it was the career front-line employees who knew what needed fixing and who were in the best place to create real and lasting change." The National Partnership for Reinventing Government presented its final "No Gobbledygook" award to two Health Care Financing Administration employees who wrote a Medicare booklet in plain language. Since Lewis and Clark surveyed the Louisiana Purchase, federal agencies have played an important role in surveying, mapping and displaying information about the United States. Today agencies are turning raw spatial, social, and other data into understandable information on the web to help communities reduce crime, promote public safety, support smart growth, and provide more responsive information and services. New survey finds that government's customer service scores nearly match the private sector, whose score has slipped slightly since last year. NASA's already high score went up, as did Customs Service, Social Security, and Medicare. Most improved was Education's Office of Student Financial Assistance. Survey measured 100 government services, up from 29 a year ago. Sixty-three percent of federal employees say they are satisfied with their jobs, according to the third annual survey conducted by the National Partnership for Reinventing Government (NPR) and the Office of Personnel Management. Food and Drug Administration employees gave their agency the most favorable rating. NASA, which was the most highly rated last year, and the General Services Administration also got high ratings. Navy had the greatest employee satisfaction increase from 1999. Some reinvention efforts have led to changes in employee views. For example, 8 percent more employees were aware that plain language was being used in their agency. 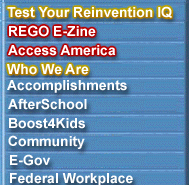 This week's "Test Your Reinvention IQ Game #20" is the last in our series - - a humorous look at 7 years of serious change. We hope you've enjoyed testing your knowledge of reinvention trivia. And, along the way, we hope you've also learned a few things about the federal government's achievements in creating a government that works better, costs less, and gets results Americans care about. For your continued enjoyment, all 20 games will remain available on this site. So long for now! The National Partnership for Reinventing Government has come to an end, but government reform continues. We thank the Government Printing Office's Federal Depository Library Program and its partner, the Government Documents Department, University of North Texas Libraries, for archiving this website exactly as it appeared on January 19, 2001. NPR's mailing address, phone numbers, and staff e-mail addresses are no longer active. For information on NPR alumni, contact Pat Wood or LeAnn Jenkins LeAnn Jenkins. You can also view our statistics.